(NARRATOR)>> TODAY ON DETROIT MUSCLE, WE'RE STARTING A NEW PROJECT AND IT'S SOMETHING WE WANTED TO GET OUR HANDS ON FOR A LONG, LONG TIME. 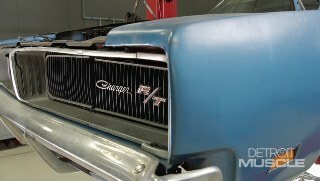 IT'S OUR FIRST STEP WITH A PIECE OF MUSCLE CAR ROYALTY. 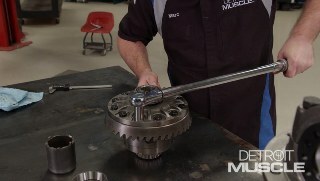 DETROIT MUSCLE STARTS NOW! (MARC)>> WELL WE MADE IT HERE TO WALKER COUNTY, ALABAMA, AND YOU COULD SAY THAT THIS IS A RURAL AREA. (TOMMY)>> WE'RE HERE, HOPEFULLY, TO TAKE HOME A NEXT PROJECT FOR US, AND I HAVE TO SAY THIS ONE'S BEEN A LONG TIME COMING. US, BUT NO MORE. WE FINALLY TRACKED ONE DOWN THAT WE'RE HAPPY WITH, THAT'S IN GOOD ENOUGH SHAPE, AND THE PRICE IS RIGHT ON IT. YEP, A 1969 DODGE CHARGER! 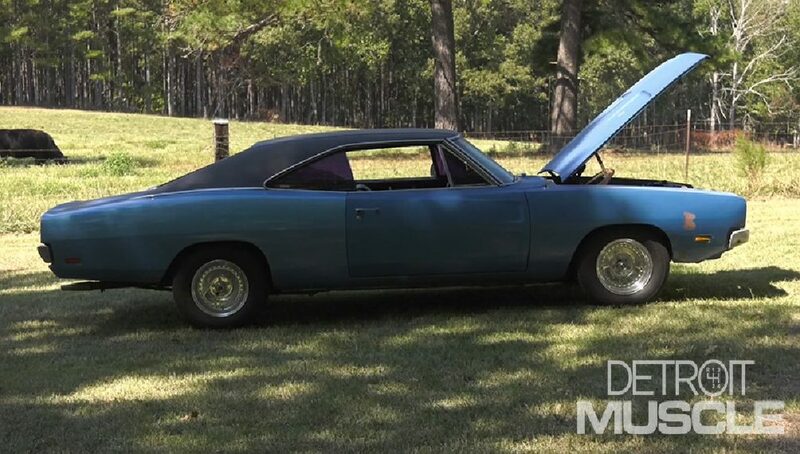 (GREG)>> THIS IS MY '69 CHARGER I'VE HAD FOR 20 YEARS, AND I'VE BEEN DRIVING IT FOR 20 YEARS, AND RESTORING ON IT FOR 20 YEARS, AND JUST I REALLY LIKE THE CAR. 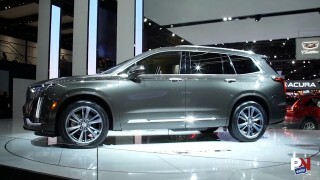 (MARC)>> WHOEVER PUT THE R/T BADGES ON IT ALSO UPGRADED THE REAR TO THE BEEFIER EIGHT AND THREE QUARTERS VERSION. SO THAT'S NICE, AND THE SHEET METAL ON THIS THING IS AS GOOD AS ANY CAR THAT WE'VE EVER BOUGHT. (TOMMY)>> THIS IS A PRETTY GOOD INDICATION OF THE ORIGINAL COLOR. IT'S LIKE A BROWNISH GOLD LOOKING COLOR, NOT THAT BLUE. ALL RIGHT, WE'RE GONNA TAKE THE OLD CAR FOR A TEST SPIN TO SEE WHAT THE FIRST IMPRESSION IS. BUT THAT'S OKAY BECAUSE THE BONES AND THE STRUCTURE OF THIS OLD CAR IS HERE WHERE WE NEED THEM. OPTION AND THAT IS THE ACCELERATOR SENSITIVE REARVIEW MIRROR CAUSE WHEN YOU GET AFTER IT, OH YEAH, IT KICKS BACK SO YOU CAN SEE IF THAT POLICE IS CHASING YOU. WOO! NOW I WANTED TO DO A BURNOUT BUT I GOT AFTER IT JUST A LITTLE BIT GETTING INTO SECOND GEAR AND I REALIZED IT'S GOT A BROKE MOTOR MOUNT. Y'ALL CHECK THIS OUT. THAT MOTOR'S GOING KABABADOOM! WE DON'T NEED TO CHANCE IT. WE'RE GONNA BREAK SOMETHING. YOU KNOW HEY, AS LONG AS THE CAR IS SOLID, WE'VE GOT SOMETHING TO WORK WITH. (GREG)>> YOU COULD SEE MY FACE WAS SAD, COULDN'T YOU CHIEF? WELL I'VE JUST, I'VE HAD THIS CAR A LONG TIME AND I FELT THAT, YOU KNOW, I JUST WANTED TO MOVE ON. I FIGURED IT'D BE A GOOD TIME TO GET RID OF IT. 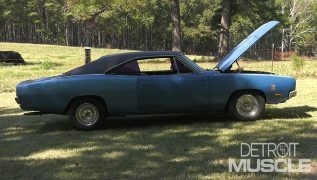 (MARC)>> WELL WE GOT OUR CHARGER BACK IN THE SHOP AND IT'S TIME TO START WORKING ON IT. WE'VE GOT SOME REALLY BIG PLANS. WE'VE DONE IN THE PAST. NOW NORMALLY WE TEAR THEM ALL THE WAY DOWN AND THEN BUILD THEM ALL THE WAY BACK UP TO THE FINISH LINE, IF YOU KNOW WHAT I MEAN, BUT THIS PARTICULAR CAR HERE, IT'S A RUNNING AND DRIVING VEHICLE, AND WE'RE GONNA TRY TO KEEP IT THAT WAY THROUGH MOST OF THE BUILD. NOW A FEW OF THE THINGS WE'RE GONNA ADDRESS TODAY IS WHAT'S GONNA BE OUR GOTTA DO LIST CAUSE WE WANT TO GET THIS THING BACK OUT ON THE ROAD AND ENJOY IT FOR A LITTLE BIT. RIDE IT DIDN'T REALLY HAVE NO GRUNT TO AMOUNT TO ANYTHING. SO I'M PRETTY SURE IT'S GONNA NEED A TUNE UP, AND SINCE THIS OLD CAR'S GOT SOME AGE ON IT I BET THOSE BELTS AND HOSES NEED TO BE ADDRESSED AS WELL. THEY'RE PROBABLY DRY ROTTED. (MARC)>> DON'T FORGET THE BRAKES. (TOMMY)>> YEAH THAT'S FOR SURE. NOW WE WANT TO MAKE SURE IF WE THROW DOWN ON THEM BRAKES THAT THE PEDAL DON'T HIT THE FLOOR. WE'RE NOT GONNA SWAP IT OUT AND LIKE DO DISC BRAKE CONVERSION YET, BUT WE'VE GOT TO GET THE THING ON THE ROAD AND HAVE US WHERE WE'RE NOT GONNA GET HURT OR ANYBODY ELSE. 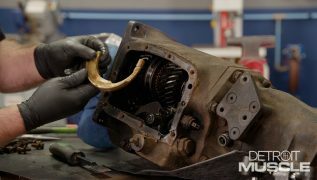 (MARC)>> ALL RIGHT, MOTOR MOUNT? YOU'RE BUYING A CAR THAT SOMEBODY ELSE HAS WORKED ON. YOU DON'T WANT SOMETHING BAD TO HAPPEN BECAUSE YOU JUST DIDN'T TAKE THE TIME TO LOOK AT THAT. WITH SOME MOPAR PEOPLE AND LOOK AT SOME COOL CARS. 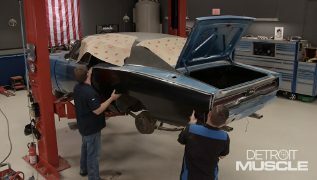 (MARC)>> YEAH, WE JUST DID BLUE ON THE CHEVELLE, AND DID A BLACK AND BLUE CAMARO, A YELLOW CAMARO, RED CHALLENGER, PURPLE CHALLENGER, WHAT'S LEFT? (MARC)>> LET'S JUST GO BLACK. (TOMMY)>> YEAH, THAT'LL LOOK GOOD. (MARC)>> IF YOU'RE GONNA DO THAT RED STRIPE YOU KNOW WHAT WOULD LOOK GOOD, SOME RED INTERIOR. (TOMMY)>> NOW WE'RE GONNA LOSE THOSE FLASHY WHEELS THAT WE HAVE FOR SOMETHING A LITTLE MORE SIMPLE. LET'S SAY SOME PAINTED STEELY'S, BOTTLE CAP HUB CAPS, AND RED LINE TIRES. (MARC)>> PERFECT, WELL WE'RE DONE. (TOMMY)>> NOW SUPPOSEDLY WE'RE STARTING WITH A 440. THAT'S WHAT WE WERE TOLD, AND IF EVERYTHING CHECKS OUT WE COULD DO A TOP END KIT AND SLAP ON A SIX PACK. (MARC)>> EVEN THOUGH THIS CAR COULDN'T ACTUALLY COME WITH A SIX PACK IN '69, IT'D STILL BE COOL. AND THREE QUARTER. SO PUTTING IN A POS UNIT, MAYBE UPGRADING TO SOME BIGGER AXLES, THAT SOUNDS LIKE A GOOD IDEA. (MARC)>> YEP, AND THAT'D BE A GOOD TIME TO DO A DISC BRAKE CONVERSION AS WELL. (TOMMY)>> YEAH THAT'S FOR SURE, BUT WE'VE GOT A LOT OF WORK TO DO AND YOU KNOW, I GUESS IT'S TIME FOR US TO QUIT SQUAWKING AND GET DIRTY. REPAIRS TO GET HER READY. TO MAKE SURE THAT WE'RE RIDING AROUND IN A SAFE CAR. (MARC)>> NOW SINCE WE'RE ON A TIME CRUNCH AND WE HADN'T TORN INTO OUR CHARGER YET, WE ORDERED A BUNCH OF BRAKE PARTS FROM ROCK AUTO DOT COM THAT WE FIGURED WE WERE GONNA NEED. WE GOT A WHOLE BUNCH OF OE PARTS LIKE HARDWARE KIT, BRAKE SHOES, A MASTER CYLINDER, AND EVEN HOSES AND WHEEL CYLINDERS. NOW NORMALLY WE WOULDN'T ORDER A WHOLE BUNCH OF PARTS NOT KNOWING WHAT WE NEEDED, BUT SINCE THIS STUFF IS SO AFFORDABLE WE WENT AHEAD AND GOT EVERYTHING, JUST USE WHAT WE NEED. IT TO THE BACKING, WELL IT CAN TURN IT LOOSE. ANOTHER THING YOU WANT TO DO IS SWAP OUT THE HYDRAULICS CAUSE WE DON'T KNOW THE AGE OF THEM. OTHER THAN THAT AND SWAPPING OUT THE WHEEL SEAL, WE'LL BE IN GOOD SHAPE. THE FIRST THING WE'LL DO IS DISCONNECT THE HOSE FROM THE BRAKE LINES. THEN WE CAN UNSCREW IT FROM THE BACKING PLATE ON THE BRAKE. THEN START UNBOLTING THE BRAKE CYLINDER ITSELF. PRYING THIS THING OUT WOULD BE EASIER IF THE SHOES WERE OFF. SINCE THE SHOES ARE GOOD, DOING IT LIKE THIS WILL SAVE US A BIT OF WORK. MIGHT AS WELL PULL THESE THINGS OUT AND PACK SOME FRESH GREASE IN THERE. WE'LL USE SOME WD 40 SPECIALIST MULTI PURPOSE GREASE TO DO THE JOB, AND IF YOU LOOK CLOSELY YOU CAN SEE THAT OLD GREASE IS BEING SHOVED OUT WHEN WE PACK IN THE GOOD STUFF. WE'LL ALSO DIG OUT THE EXCESS GREASE THAT'S DOWN INSIDE THE HUB. THEN REPLACE THAT FRESHLY PACKED BEARING. WITH OUR NEW SEAL IN PLACE WE'RE IN BUSINESS. DON'T WANT TO RUN ALL OF THAT THROUGH YOUR BEARINGS. YOU WANT TO SEE SOME FORM OF A DRAG BUT NOT A WHOLE LOT. (TOMMY)>> WELL THAT PRETTY MUCH DOES IT FOR THAT ONE. WE'VE GOT THREE MORE TO DO AND WE'LL SEE Y'ALL HERE SHORTLY. (NARRATOR)>> STICK AROUND WHILE WE WRAP UP OUR SPEEDY FIXES TO MAKE OUR CHARGER RUN LIKE A CHAMP. INSTALLED THAT NEW MASTER CYLINDER, TOPPED OFF THE FLUID, AND GOT THE BRAKES BLED. NOW IT'S TIME TO MOVE ON TO UNDER THE HOOD. NOW WHILE TOMMY'S DOING THE TUNE UP I'M GONNA TRY TO FIGURE OUT WHAT EXACT ENGINE THIS IS. WE WERE TOLD IT WAS A 440 OUT OF A '71 BUT WHO KNOWS. WE KNOW THERE'S A STAMPING UNDER HERE WHERE THIS COIL IS. SO WE'RE JUST GONNA TAKE THIS BOLT OUT, MOVE IT TO THE SIDE, AND SEE IF WE CAN SEE IT. WELL WE CAN SEE HERE THAT IT IS A 440 AND THE "H" MEANS THAT IT WAS BUILT IN '72. CLEAN THOSE PLUGS. A TUNE UP ON THIS THING WILL DEFINITELY WAKE IT UP. 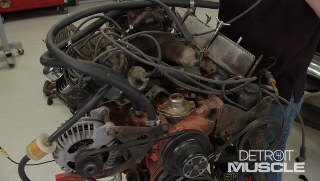 TO GET OUR MOPAR DIALED IN WE WENT TO ROCK AUTO DOT COM AND GOT US A FEW PIECES. 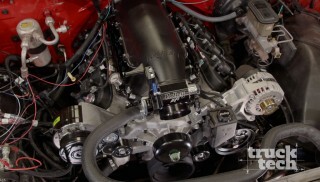 WE GOT THE STANDARD TUNE UP PIECES AND A SET OF MOTOR MOUNTS TO HELP KEEP THAT ENGINE PUT. NOW A FEW OF YOU BOYS MAY BE SITTING BACK THERE GOING, WHAT THE HECK MAN, YOU DON'T HAVE ANY POINTS? WELL LUCKILY FOR US SOMEBODY'S DONE CONVERTED THE CHARGER TO ELECTRONIC IGNITION. NOW ALL WE'VE GOT TO DO IS GET THESE PARTS ON. WHEN INSPECTING YOUR CAP YOU WANT TO LOOK AT THE CONTACTS IN HERE AND SEE IF YOU SEE ANYTHING BURN UP OR CORRODED. THESE ARE IN BAD SHAPE, AND THE CAP NEEDS REPLACED. (MARC)>> NOW WE CAN GET OUR NEW PLUG WIRES INSTALLED ON THIS OLD 440. WE'LL ALSO GO AHEAD AND SWAP IN THAT NEW FUEL FILTER. THEN HEAD UNDER THE ENGINE. OUT THIS BOLT, AND SEE IF WE CAN WIGGLE MOST OF THAT MOUNT OUT. ONCE WE GET THE NEW MOUNT SET IN PLACE, WE CAN GET HER BOLTED IN, AND WE'VE JUST SOLVED OUR PROBLEM OF NOT BEING ABLE TO DO ANY BURNOUTS. LEAK IN THE RADIATOR WE'VE GOT SOME BARS LEAK STOP LEAK TO ADDRESS THAT, AND WE'RE NOT GONNA DO ALL OF THIS WITHOUT CHANGING THE OIL. SO WE'VE GOT SOME ROYAL PURPLE HIGH MILEAGE SYNTHETIC OIL AND NEW FILTER. (NARRATOR)>> STILL AHEAD, HOP IN WITH US WHILE WE HEAD TO MOPARS AT THE MUSEUM. (TOMMY)>> I DON'T KNOW IF YOU KNOW OR NOT, BUT THIS OLE MOPAR'S RUNNING A LITTLE BETTER THAN WHENEVER WE TOOK IT FOR A TEST SPIN. (TOMMY)>> NOW WE'RE JUST RIDING SOME TWO LANE ROADS HEADING SOUTHBOUND, TRYING TO GO SEE A GOOD FRIEND OF OURS. (MARC)>> YEAH A BUDDY OF OURS HAS A MUSEUM DOWN IN ALEXANDER CITY, ALABAMA, AND IT'S MOSTLY MOPARS. SO IT'D BE IDEAL TO TAKE A LOOK AT THOSE CARS, AND THE SPECIAL EVENT HE'S GOT GOING ON IS CALLED MOPARS AT THE MUSEUM. I THINK THAT'S THE PERFECT PLACE FOR US TO TAKE THIS THING. THERE'S GONNA BE A BUNCH OF PEOPLE THERE WITH THEIR MOPARS. SO WE CAN LOOK AT THOSE CARS, TALK TO THOSE PEOPLE, GET SOME INSPIRATION FROM THEM AND THEIR CARS. IT'S GONNA BE EXCITING. (TOMMY)>> WHETHER YOU'RE A MOPAR FAN OR NOT, ATTENDING A SHOW AT THE WELLBORN MUSCLE CAR MUSEUM WILL HAVE YOU GRINNING LIKE A KID IN A CANDY SHOP. FOLKS FROM ALL AROUND HAVE BROUGHT THEIR RIDES TO SHOW OFF AND SHARE THIS WEEKEND. ROAD RUNNERS, SUPERBIRDS, RARE CUDAS, DUSTERS, AND EVERYTHING IN BETWEEN. MOST IMPRESSIVE COLLECTIONS TO BE FOUND ANYWHERE. ULTRA RARE RIDES, ORIGINALS AND RESTORATIONS, EVEN CARS THAT HAVE MADE RACING HISTORY, LIKE THE K&K DAYTONA. TIM WELLBORN IS A TRUE ENTHUSIAST AND A CHRYSLER CONNOISSEUR BUT THERE'S ONE THING YOU WON'T FIND AT THIS SHOW. (TIM)>> THERE'LL NEVER BE A JUDGED CAR AT A WELLBORN EVENT BECAUSE IT'S JUST ONE OF THOSE THINGS THAT YOU MAKE ONE PERSON HAPPY AND THREE UNHAPPY, AND SO I BELIEVE IN TALKING ABOUT OUR CARS, AND THE HISTORY, AND WHY WE HAVE THEM, AND THAT'S WHAT WE DO HERE. (MARC)>> ALL RIGHT, WE KNOW IT'S A LITTLE ROUGH. ( )>> I WOULD CLEAN IT UP A LITTLE BIT. ( )>> I DON'T KNOW ABOUT HE HORNS. THAT WOULD BE SOMETHING THAT YOU COULD PROBABLY DO WITHOUT. ( )>> YEAH, THE 440 THAT'S IN IT, THAT'S GREAT! MAYBE BUILD THAT OR SOMETHING. ( )>> I WOULD DEFINITELY DO, LIKE, FUEL INJECTION. (TIM)>> I THINK I WOULD LEAVE IT LOOKING THE WAY IT LOOKS, BUT IT WOULD HAVE A SIXONE, OR A 392, OR SOMETHING UNDER THE HOOD. ( )>> PROBABLY LIKE A GRAY OR A BLACK. ( )>> IT'S GOT TO HAVE A REALLY GOOD SHEEN TO IT, NOT JUST A FLAT BLACK. ( )>> I THINK YOU NEED TO HAVE IT WORKED ON BEFORE YOU BRING IT BACK TO ANOTHER SHOW. (TOMMY)>> WELL THAT JUST MIGHT BE THE BEST ADVICE THAT WE RECEIVED ALL DAY. WE FOUND A TON OF INSPIRATION AT THIS SHOW. (MARC)>> SO MUCH THAT WE CAN'T WAIT TO GET BACK TO THE SHOP AND GET BUSY. SHIFT WORKS, WHICH AN ELIMINATE ALL THE GUESS WORK. THIS KIT ALLOWS YOU TO MODIFY YOUR FACTORY SHIFTER TO WORK WITH YOUR UPGRADED TRANSMISSION, WHETHER YOU'RE UPGRADING FROM A TWO SPEED TO THREE SPEED OR THREE SPEED TO FOUR SPEED. REQUIRES HIGH OCTANE FUEL FINDING AN EASY WAY TO FILL UP THE TANK CAN BE QUITE THE CHORE. A CAN OF RACE GAS CAN CHANGE THAT. JUST POUR THE RIGHT AMOUNT OF THIS POWERFUL STUFF INTO YOUR TANK OF REGULAR PUMP GAS TO GET THE DESIRED OCTANE RATING, UP TO 105. CARRY THIS STUFF AROUND WITH YOU AND YOU WON'T HAVE TO WORRY ABOUT TRYING TO FIND THE RIGHT GAS FOR YOUR RIDE, BUT WE'RE ALL OUT OF TIME FOR NOW GUYS. SO UNTIL NEXT TIME Y'ALL KEEP IT BETWEEN THE DITCHES.